A misleading biography is published by Voice of America (VOA) about the background of Setareh Derakhshesh (1). It says Ms. Derakhshesh holds a PhD degree from Sorbonne. We know France has many kinds of doctoral degrees and not all are equivalent to a PhD degree in the U.S. Also by saying Ms. Derakhshesh has taught at Georgetown University, the bio tries to further give the impression as if she were related to Georgetown Political Science Dept, or Georgetown Law School, whereas she was just a guest lecturer teaching a French language class and never taught political science or law at Georgetown University. I cannot recall having seen any articles in the press, about Iranian politics or politics in general or any other topic for that matter, in Persian or in English, by Ms. Setareh Derakhshesh, before she became the VOA Persian Division director, where she now thinks so highly of herself to send a personal Nowruz message for Iranian people. There are currently reports including one in the Iranian opposition press (2) that she had ordered VOA Persian Internet service manager who was later fired by her, to illegally make false spam reports to Internet companies like Google Gmail, to stop those in the Iranian diaspora from informing VOA staff about what was happening at the VOA during the Obama years (3). Ms. Derakhshesh considered those opposition writers as a challenge to her undeserved position at VOA. 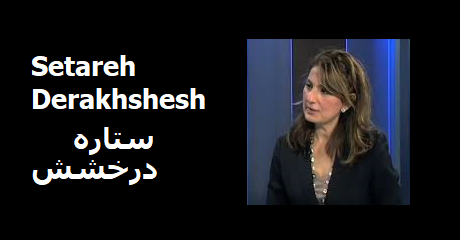 There are also rumors that Ms. Setareh Derakhshesh uses VOA contacts to control what shows in the Google search of her name in Persian and in English. It is about time for Voice of America to take a hard look at the wrong decision that led to making Ms. Setareh Derakhshesh, the director of VOA Persian Service (4).